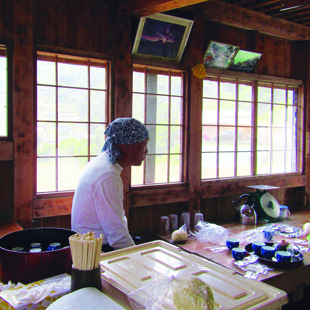 Deep in the mountains of Shikoku, there is an udon master who has built a rustic kitchen next to his home. 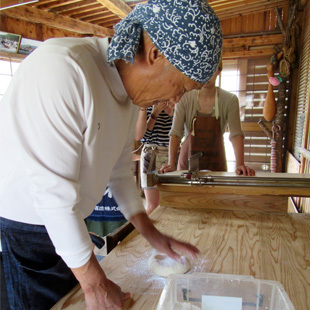 Hideo Shimotera, a 74-year-old retired salaryman, now teaches people how to make handmade udon in his appointment-only workshop. Metropolis went along to find out the tricks of his trade. Shimotera is a man of few words who speaks little English and is not keen on chitchat: he’s here to teach the art of udon, and that is clearly his focus. He is reserved but self-assured, and carries himself with a quiet confidence. It’s hard to imagine this man, the master of his kitchen, in his former office environment. 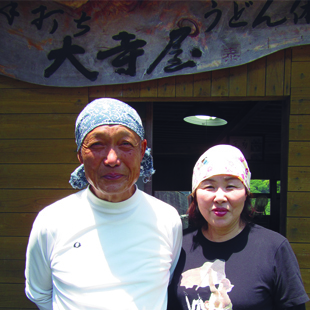 I meet Hideo and Utako Shimotera in a small village in Miyoshi-shi, Tokushima Prefecture. Shimotera begins the workshop with little introduction before I and my fellow udon tutees put on our aprons and headscarves and get started. He shows us how to carefully measure the udon flour to the exact gram before putting it in a bowl and adding water and salt. He then uses his hands to mix the flour and saltwater together to create a doughy ball. But what he does next comes as a surprise—he puts the dough between two plastic sheets and stands on it, kneading it with his feet to flatten it out. The table looks a little precarious, so when it comes to my turn, I gingerly knead and hop off quickly. 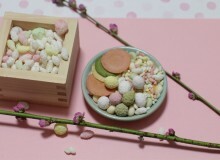 Shimotera teaches the art of kneading dough the traditional way. He starts by peeling the dough off the sheet and remaking it into a ball before placing it in a clear plastic bag, so no air can get in. I do the same and he offers us some hot matcha tea while we wait for the dough to rest. In the meantime, Shimotera goes into his nearby garden to cut some negi (green onion), to prepare as a garnish for lunch. Shimotera takes time out to let the udon mixture rest. After about half an hour, it’s time to take the dough out of the bag. 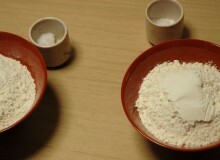 Shimotera places it on a table, sprinkled with flour, and uses a rolling pin to flatten it out into a thin pizza-like shape. I follow his example, though my own dough refuses to roll out smoothly and Shimotera shakes his head in wonder. Shimotera then stands on the dough again and kneads it with his feet before rolling it out for a second time. I watch him work hard to flatten the dough until it’s about three millimeters thin. It takes time and cannot be rushed. 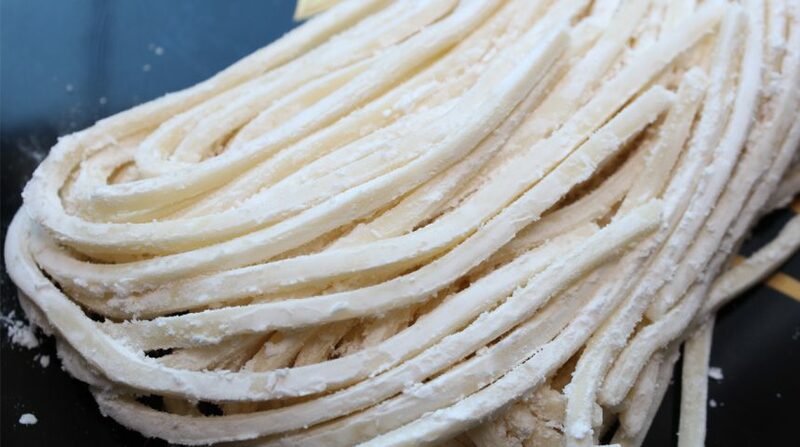 The udon sensei folds his thin dough in half, and uses a guillotine to cut each noodle about three to five millimeters thick. He then shakes the noodles, which resemble a floury wig of hair, against the table. Again, my own dough refuses to cooperate, and my noodles are short and stunted. I secretly hope I can discard mine and eat only the sensei’s udon for lunch. Finally, it’s time to cook the noodles. Shimotera puts the noodles into boiling water and uses his cooking chopsticks to swirl the water in a figure eight motion. Soon, the noodles are ready for rinsing. We place a raw egg yolk in each bowl and add the hot udon before mixing it together. Bowls wait in line as we prepare to eat freshly made udon. 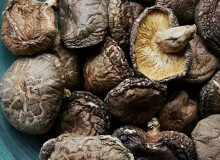 We add negi, shoyu, and tempura that Utako Shimotera has made. 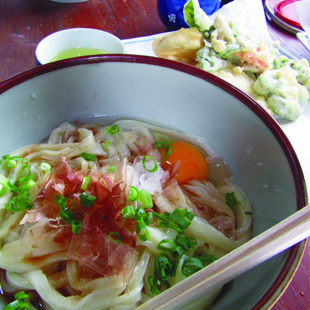 There are cries of “oiishii” (“delicious”) from around the room as we taste the udon. The meal is simple and comforting; the noodles have a perfect texture, light and slightly chewy. Everyone goes back for seconds. I’ll never be able to buy instant udon from the convenience store again. But at least I can now make my own.